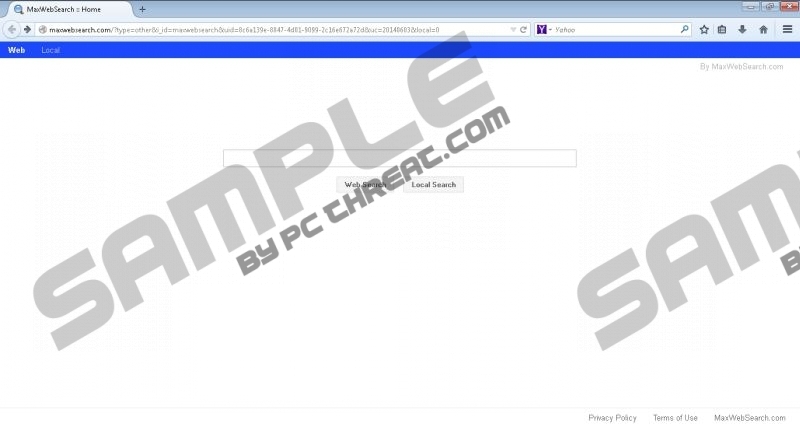 Maxwebsearch.com is a browser hijacker which often travels with a misleading cover-up. For example, you may discover this hijacker on your browsers after allowing Yahoo to replace your previously active default search engine and home page. Needless to say, in this case the name of the popular search engine is used illegally to trick you into activating undesirable changes. Besides installing itself without any authorization and affecting the most popular web browsers, including Chrome, Firefox or Internet Explorer, the malicious infection can also initiate illegal connection to the Internet. You can prevent this only if you remove Maxwebsearch.com from the system. As recent research has revealed, maxwebsearch.com is the newest copy the Websearchy.com, another hijacker you should delete. The infection runs an irritating browser protection application which presents a pop-up alert every time you browse the web asking you to keep the settings of your browsers changed. Needless to say, no one would install this browser hijacker onto the operating system themselves, which is why the developers of the infection had to become more clandestine. It has been discovered that the hijacker can be presented as an additional offer by Premium Installer and Optimum Installer bundles. These can promote AbiWord word processor, YTDownloader, MyPCBackup, PC Optimizer Pro, SpeedItup, and other completely unreliable and undesirable applications. When you use or interact with our Services, we may collect certain anonymous information that is not sufficient to permit someone to identify you by name, email address, mailing address, telephone number, social security number, driver’s license or other government-issued identification. Maxwebsearch.com removal is something you should perform as soon as possible. This browser hijacker is intrusive, can spy on you and then use the seemingly authentic search provider to present sponsored search results. Clicking on ads presented by a browser hijacker is considered to be dangerous because they could be used to redirect you to corrupted sites or present you with misleading offers. You should install automatic malware removal software to delete Maxwebsearch.com hijacker; however, the removal of the undesirable search tools must be performed manually. The guides below will assist you. Click the Start button on the left of the Task Bar. Navigate to the Task Bar at the bottom of the screen and open the Start menu. Access the Metro UI menu, right-click to open a pane and select All apps. Open the browser and click the search provider icon on the Firefox search box. Now select Manage Search Engines and Remove the undesirable search provider. Open the browser, simultaneously tap Alt+T and select Manage Add-ons. Go to Search Providers, then add a new and Remove the unwanted search provider. Open the browser, simultaneously tap Alt+F and select Settings. Navigate to On Startup and mark Open a specific page or set of pages. Click Set pages and overwrite/remove the undesirable search tool. Go to Appearance and mark Show home button. Click Change. Overwrite/remove the undesirable search tool and click OK.
Click X on the URL of Maxwebsearch.com to remove it and select Done. Quick & tested solution for Maxwebsearch.com removal.